We've seen pictures of Kia's plucky-looking little sports car before, and I'm happy to say seeing it right in front of you doesn't disappoint. The proportions are dead-on, the details fantastic, and the whole thing looks like a blast. Now we just need to convince them to build the damn thing. The GT4 Stinger was created in under a year by a six-person team, who were at the unveiling all dressed up in the same carefully-dishevelled black suits in what was quite clearly some marketing PR guy's idea of what cool is. Really, though, the team could have been wearing miner's helmets and hot pants for all anyone cared, because this little car just looks great. That great look allegedly started from a napkin sketch, and the goal throughout the project was to keep the design as pure and basic an expression of sports car as possible. 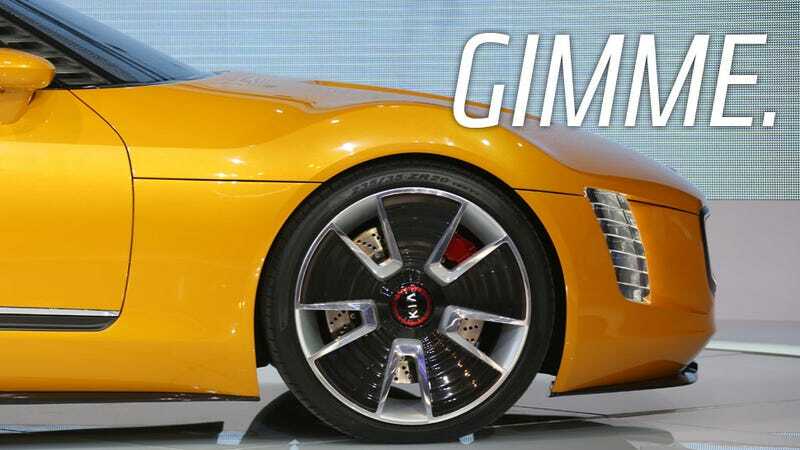 The yellow color was decided early, and that helped inform the name of the car, since bees and yellow and stingers. Kia says it's a real, driveable-at-speed car under all the show car frippery, on a custom-built "tube-like" chassis that is certainly not a current Kia or Hyundai platform. It stimulates all the Jalop-desire-gland receptors: RWD, manual six-speed, 312 HP 2L turbo four, double-wishbones front and rear, stripped-down interior, big Brembo brakes all around. The interior is cultivating a very minimalist/racer kind of look, with lots of bare sheet metal and fabric pulls for things like door handles and seat adjustment levers. The gauge cluster is clearly a show-car indulgence, being, you know, clear. They also went a little austere and didn't include any audio system, which is understandable if the engine sounds incredible, but even then at some point you'll be longing to hear Terry Gross' soothing voice on your local NPR affiliate. Unless it's pledge drive week. Of course, none of this really matters unless Kia's actually going to build the thing. I asked Erik Klimisch, a Design Manager at Kia and part of the Stinger team, this very question, of course, I didn't get a definite answer. What he did tell me was that Kia does have a history of putting concepts into production, and he suggested that the Stinger is at least a possibility for production. Klimisch acknowledged that there is a big sports-car shaped hole in Kia's lineup, and something like the stinger sure would fill it well, and make a pretty nice FR-S/BRZ fighter as well. The lack of a suitable existing platform is an issue, but most of the drivetrain at least could be sourced from existing Hyundia/Kia warehouses. The design of the car itself would hopefully make it to a production version relatively unchanged, though certain exciting features like the perforated A pillar may have to be sacrificed on the altar of Our Lord Of Cramming Airbags Into Everything. The long-hood/short deck proportions are classic 2+2 sports car, and while Pininfarina was cited as an influence, the car I see most in the design is the Lancia Stratos, with the almost-wraparound windshield and those tight, bulging front fenders. It's by no means aping that, but I feel some influences there, and that's a good thing. Kia says they'll be watching press and public reactions very carefully to help decide if this is a project they want to pursue; I'm pretty confident our audience at least will give a pretty definitive answer.